THIS DELIGHTFUL, DOG FRIENDLY DAY HIKE TAKES YOU ALONGSIDE A BEAUTIFUL CREEK THAT CLIMBS GENTLY THROUGH A FOREST OF SPRUCE, PINE, AND ASPEN. UPON REACHING THE FIRST LAKE YOU WILL HAVE STUNNING VIEWS OF NEARBY ALPINE PEAKS. MAKE SURE TO PEER INTO THE CRYSTAL CLEAR WATER FOR A CHANCE OF SPOTTING BROOK TROUT. THE SECOND AND MORE EXPANSIVE LAKE IS A QUICK JAUNT DOWN THE PATH, AND SERVES AS A GREAT SPOT TO ENJOY A RELAXED MEAL. Elevation: 9,120 ft. – 10,340 ft. Directions: To reach Harvard Lakes via Elk Creek Trail it is not necessary to have 4WD. Head north out of Buena Vista on Highway 24. Roughly three miles north of the stoplight in downtown Buena Vista, you will turn west onto County Road 384. Continue for 1.3 miles and then turn north onto County Road 361. After 1.5 miles turn west onto County Road 368, it is the left hand road where C.R. 361 transitions from gravel to dirt. After 1.2 miles veer left onto 368 A just before the community mailbox. Parking for the trailhead is only a quarter of a mile further up the road (it is a dirt shoulder on the road) and can be recognized by the trailhead marker. There is an open expanse dotted by Ponderosa Pines across from the trailhead. Route Info: The trail leads due west from the road for one mile, while gradually climbing in elevation, before reaching a fork. Keeping left at the sign reading Three Elk Trail you will head south and venture into an old logging forest. Once you have crossed Three Elk Creek for the first time you will begin moving in a south westerly direction, and will soon notice an increase in gradient. Continue moving higher into the forest where you will eventually reconnect with the creek. For the remainder of the hike you will parallel the cascading water. After traveling 1.7 miles from the fork you will intersect the Colorado Trail. Head west along its path for a tenth of a mile to behold the first (smaller) lake. From here you continue two tenths of a mile to reach the second lake. 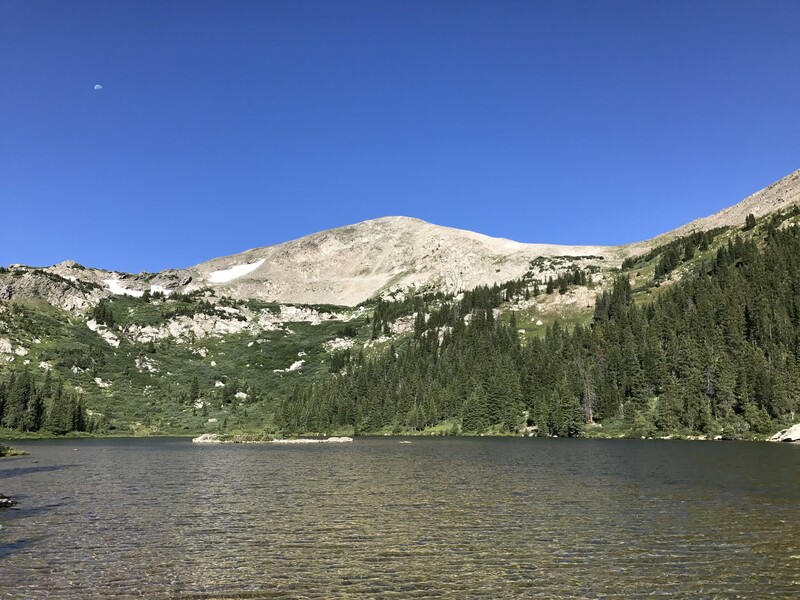 Kroenke Lake: The hike to Kroenke Lake has stunning views and a trail that runs right next to a stream. Start at the North Cottonwood Trailhead and travel through beautiful, lush forest until you reach the high alpine lake. The first part of the hike is relatively mellow, but then you'll gain significant elevation, so it may be a bit strenuous if you aren't used to the altitude. There is a junction at mile 2.0 where the trail splits (make sure to follow the sign to Kroenke here). You''ll cross several creeks along the way to Kroenke. Near the lake you'll find several camping spots for an overnight, and there's great fishing at the lake, so bring a fly rod if you have one. Directions: From downtown Buena Vista, head west on Main Street and head towards the mountains. Turn right at the stoplight onto U.S. Highway 24 North and travel for about 0.4 miles before turning left on Crossman Avenue which turns into Country Road 350. After about 2.1 miles on Crossman / CR 350, turn right onto County Road 361 and travel on CR 361 for a little less than a mile until you see a sharp left. You’ll take that sharp left onto County Road 365 and travel on the road which will then turn into dirt/gravel all the way to the North Cottonwood Trailhead (about 5 miles). Lake Ann: A moderate hike with open meadows and impressive views of the Three Apostles peaks and Mount Huron. Lake Ann is known for its sparkling turquoise water and serves as a wonderful location to soak in the Colorado Rockies while fishing or eating a picnic lunch. Route Info: Once you reach the trailhead, you’ll see the route to Mount Huron on the left and the route to Lake Ann on the right (behind the trailhead sign). The beginning 1.7 miles of the route is relatively flat, and you’ll cross a couple trickling streams. At 1.6 miles, stay to the right, as there is a fork between Lake Ann/Continental Divide Trail on the right and the Apostles Trail to the left (a sign will clearly mark this split). At 3.2 miles, you’ll find a waterfall towards your left; you must cross it to get to the trail on the other side. The route will get quite a bit steeper after the waterfall and will switchback. As you ascend up the tundra face, you’ll start seeing views of the beautiful valley. At mile 3.7, you’ll come to another fork in the trail. Stay left and continue another 800 feet until you reach to the lake (the right trail leads to the Continental Divide). Browns Lake: A stunning alpine lake with incredible views surrounding the water. The Browns Creek Trail will lead you through a breathtaking meadow, and you’ll see and hear the trickling creek for much of your hike. After about 2.5 miles, look for a sign that indicates a waterfall and veer to your left to view the gorgeous falls. If you want to make this hike easier, stop at the waterfall to take a break or eat lunch, and then head back the way you came, making it a 5 mile round trip. Continue another 3.5 miles to the lake if you want a tougher hike or if you want to stop for a night of camping. Browns Lake is a great place to base camp before peaking Mount Antero. Directions: From downtown Buena Vista, travel east on US Highway 24 (heading towards Salida). After about 2.4 miles, US-24 East will turn into US-285 South. Continue about 8.8 miles until you reach County Road 270. Turn right onto County Road 270 and continue for about 1.5 miles, and then continue straight onto County Road 272. After about 2 miles, turn left to stay onto County Road 272. Keep following County Road 272 until you reach the Browns Creek trailhead. Total driving time from downtown Buena Vista should be about 30 minutes.